Let's face it. The yellow pages are dead. The days of finding an installer in the phone book and letting them pick your generator are long gone. Today's savvy customers are leveraging the internet first to find the perfect generator at an affordable price, then finding an installer to set it up. 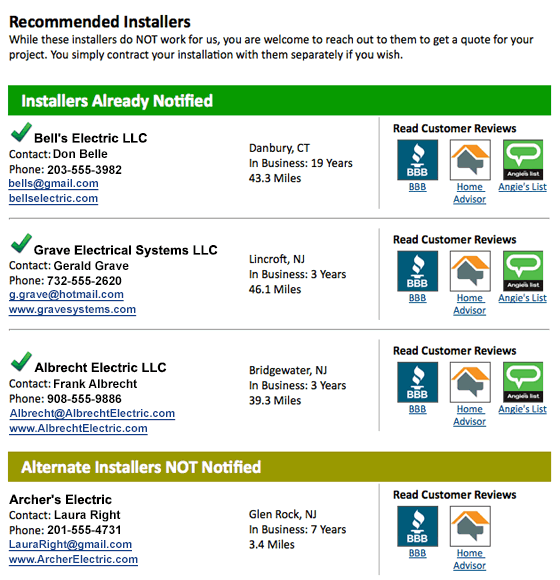 Before you check out, make sure that you check the box, indicating that you are interested in receiving quotes from local installers. 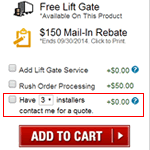 You can choose the number of installers (either 3 or 5), depending on how many quotes you want to compare. At checkout, you get a receipt via email. 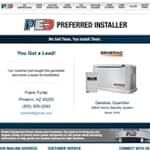 If you requested an installer, you receive a separate email like the one below, highlighting the Preferred Installers that we automatically contact and alternate installers if you want to expand your search. We also email each of the Preferred Installers, providing them with your email address, phone number and items ordered. The installers will contact you directly to schedule an appointment and offer a quote. You simply compare the quotes to get the best price or installer for your project. Local Generator Installers.. Our Power Equipment Direct how-to library can help you learn about How to Use a Generator for Tailgating, How to Get the Right Generator for Your Home and How to Save Electricity with Load Shedding.